Comparative reports give you the flexibility to customize the way you interact with your data. 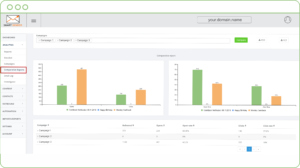 Aggregate and compare campaign results to find your marketing baseline and track your performance over time. Create segments within your reports to find new engagement patterns. Comparing several email campaigns side-by-side can help you determine exactly what was different, what continues to work, and where improvement can be made. This pie chart can help you find the answer whether or not ESPs accept your email – can the message physically be accepted. it was accepted by the recipient ISP server. Delivery rate Percentage of Delivered messages from total sent. Hard bounces The time and hard-bounce code received from the ISP. A hard bounce indicates a permanent reason why an email cannot be delivered. Hard bounced email addresses are immediately automatically placed in your account’s BlackList to prevent degradation of your domains reputation. Hard bounce rate Percentage of Hard bounced emails from total sent. Soft bounces Soft bounces typically indicate a temporary delivery issue to an address. SmartSender will automatically try to resend the message during 3 days. When the message is delivered the status will change to Delivered. Soft bounce rate Percentage of Soft bounced emails from total sent. Rejects Email address is already in our blacklist and SmartSender rejects to send message to it. Reject rate Percentage of messages with reject status from total sent. Open tracking tells you if your contacts open the emails you send. Your campaign report will show how many contacts opened your campaign, and how many total opens the campaign received. Open tracking can help measure subscriber engagement. Total opens Total number of times the campaign was opened by recipients. This count includes multiple opens from individual recipients. Unique opens Number of recipients that opened the campaign any number of times. Open rate The open rate is a percentage that tells you how many successfully delivered campaigns were opened by subscribers. To find this out, SmartSender loads a tiny, transparent image into each campaign, and counts how often the image is loaded among the delivered campaigns. The image is invisible to your subscribers. Click tracking allows you to see if contacts have clicked links in your campaign. Your campaign report will show which contacts clicked your links, and how many times each link was clicked. Like open tracking, it can help measure subscriber engagement. Total clicks Total number of times any tracked link was clicked. This count includes multiple clicks from individual recipients. Unique clicks Number of recipients who clicked any tracked link. Click this number in your report to open a list of subscribers who clicked. Click rate Percentage of total recipients who clicked any tracked link in the campaign. The click rate is a percentage that tells you how many successfully delivered campaigns registered at least one click. Clicks to open rate Percentage of recipients who opened your campaign and then clicked a link. Unique clicks to opens rate Percentage of unique recipients who opened your campaign and then clicked a link. SmartSender tracks abuse reports, also known as spam reports or complaints. Complaints Number of recipients that reported your email as spam. Subscribers that report a campaign as spam are automatically placed in your account’s Blacklist. Complaint rate Percentage of recipients who reported spam from total Delivered. Delivered by date Total successfully delivered messages by date. Hard bounces by date Total hard-bounced messages by date. Soft bounces by date Total soft-bounced messages by date. Rejects by date Total rejected messages by date. Total opens by date Total number of times the campaign was opened by recipients by date. Total clicks by date Total number of times any tracked link was clicked by date. Complaints by date Number of recipients that reported your email as spam by date.